THE meaning of birds, pagan undercurrents in a country women’s fund-raiser and a voyage around a small boat feature in my blog. Stuff from the far side, art and art history will drift through some stories. Some pieces will have previously appeared as columns in The Gisborne Herald. They live here now so apologies to the three people who have already read them. Short fiction will appear but very occasionally. These are strange and entertaining and have nowhere else to go. Which, broadly speaking, is the point of badcactus.org. The tattered face of Melbourne’s Luna Park has been patched up since I took this picture with a crappy supermarket camera around the turn of the century. To enter the amusement park you walked into the gaping mouth beneath the facade’s mad blue eyes. Fun fair spookiness suggested by the entrance was matched by the horror-fun of the big dipper. At the top of each gut-plumetting loop, the car lifted off the rails and floated above the track like we were in a Loony Tunes cartoon. That is the spirit of badcactus.org. Australian artist Sidney Nolan painted several pictures of Luna Park. His naive style suits the lurid character of the fair. Most painters who took a run at the park picked up on its cartoonish sinisterness. The blog’s title bad cactus comes from the first story I posted in badcactus.org. I added the prefix “bad” because it made it sound gangster. 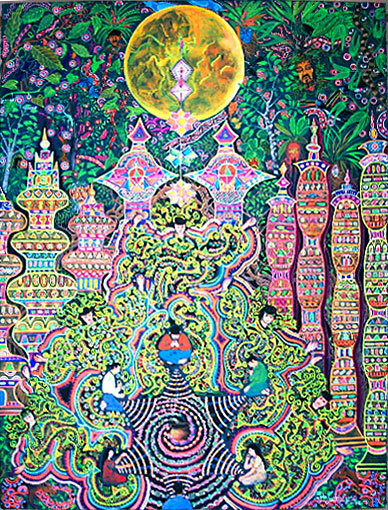 The tag line – “the main thing to understand is that we are imprisoned in some kind of work of art” – is from American psychonaut Terence McKenna. McKenna’s investigations included culture and the origins of human consciousness.